It seems like Celtic knotwork (or knotwork in general) has been around forever. It is likely that humans have probably been drawing knotwork for almost as long as they have been weaving / knotting it together. Some of the earliest creations made by mankind would have been things like rope bags to carry things in which will have required a certain level of skilful knotting. From this perspective, our connection with knots is almost as deep as with our connection with fire…Maybe. Celtic knotwork as an ancient form of art can be found all around the world, from China and India all the way to many parts of Africa. You can still find strong knotwork depictions in their cultures today. That being said, the origins of knotwork seem to be originally in Europe as you would expect and although we don’t know exactly how far back, we do know that the Romans also picked up on the knotwork style from the Celtic tribes and amplified it. As the greatest empire in the world at the time, the Romans left their mark on every country they occupied or even traded with and the mark they left will have included some of the newly absorbed ideas from the cultures they had conquered, including that of the Celts. As such, Celtic artwork was spread around the Roman Empire and you can still find examples of Roman knotwork in their mosaics. In a way, the Romans reintroduced Celtic knotwork to Britain and the exposure to other styles will have made the style even stronger than it was before. The art style that would have been most popular in Britain at this time was the high art style of La Tene. Knotwork in this style as we know it, along with geometric patterns and floral designs really came together in the 5th or 6th century and is the art style that is represented in the book of Kells and the Lindisfarne gospel. This is particularly interesting as it shows that the art style of the indigenous pagan Britons was taken up by the Christian monks as well. Despite their spiritual beliefs, both the Christians and the Romans will have known there was a magic in the art styles that is still present in the knotwork you see today. It is a true form of magic and is a part of the spell that made the art style progress forward. Regardless of who was creating the art and for what reason, it would have been just as familiar to the viewer. In the same way that the early Christians would incorporate certain traditions from the indigenous tribes into their ceremonies, the familiarity of the art they created in the book of Kells was not by chance. Similarly, it is likely that to aid conversions and ease the transition to a new religion, the Christians continued the practice or worship on the same sites sacred to the pagans. To this day, many early Christian church sites are found on sites that were originally sacred to the pagans and you will often find sacred Yew trees in their churchyards. After the dark ages, knotwork fell out of use for a long time in Europe (and especially in the UK) during the medieval period as this was an extremely progressive period where there was a mixing of many influences from the Eastern world as well as the old Roman world. However, knotwork was still present to those who held strong roots to the Celtic heritage. For example, as the Tudor dynasty had strong connections with Wales, there are many examples of Celtic knot work shown including the most famous portrait of Henry VIII which features many items decorated in knotwork. Scholars and historians usually make a distinction between Celtic and Scandinavian / Germanic cultures based on their language, culture and laws. This is not untrue but at the same time, there will have been many crossovers between the cultures including the use of knotwork. Just as how 3-4000 years ago it was quite common for art to progress forward such as the Egyptian petroglyph style and the realism introduced by the Greek empire, Celtic art regressed back to a more primitive symbolistic style. This could have been due to people not having any kind of artistic teaching and when they tried to draw things realistically, they failed miserably. By creating their drawings stylistically instead, they would have been able to copy from their peers and the style will have spread more easily. Amongst the many crossovers of ideas between the Celtic and Germanic cultures, it is said that the Celts made the basis of the first longships that the Scandinavian cultures later became famous for as well as chainmail and other things. Knotwork was certainly present in the Vendel era (or the migration period) and probably originated from the crossover of the Celtic and germanic culture. It is said that knotwork in Scandinavian culture is a poor imitation of the Celtic art style, which is probably true as the Celts had already set the bar for the usage of some of these ideas. The Celts were master goldsmiths / silver makers and in the 5th and 6th centuries their art style was able to flourish, especially during the Romans occupation of Britain, before the island descended into a dark age. The vikings are certain to have come across a lot of Celtic artefacts during raids or whilst trading and it is likely they would have taken some of these back for their artists to copy. 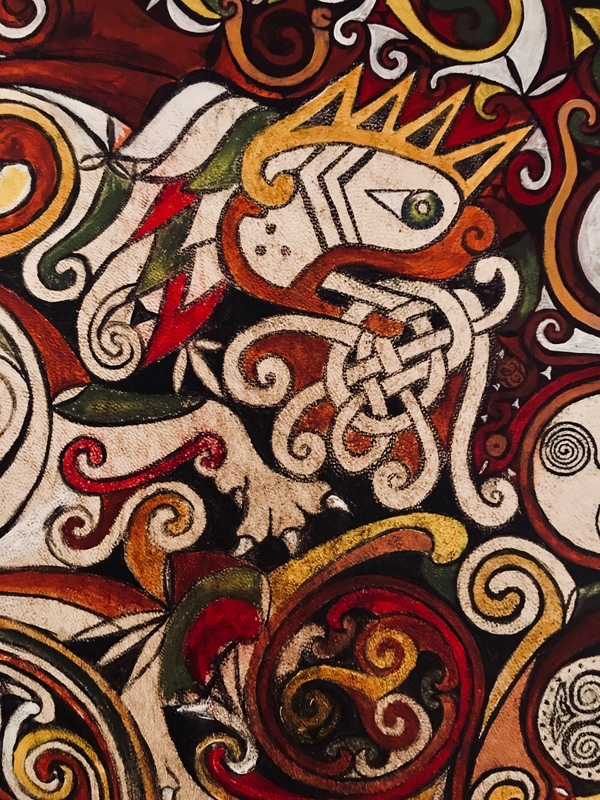 Although it is likely that there would have been some form of knotwork present in Scandinavia from the Vendel period, the crossover of artistic ideas with the Celts would have inspired a new type of artistic impression amongst the Norse artists. The influence of the Celtic knotwork styles mixing with the styles of the existing native artists will have evolved the style further. An example of this can be found in the Borre style of artwork. This style of Scandinavian / Viking art, contains many elements that are believed to be only present in certain areas of Northern Europe. One of the ideas within the Borre art is that the artist created many small bear-like faces amongst the designs. This type of very animal based art is known as zoomorphism and was a feature of many Hallstatt art styles. In fact, throughout the viking period, there will have been a lot of inspiration coming in for their artists from the outside. For instance, by comparing the Oseburg art styles from all the grave artefacts found with the later Viking art style known as Urnes, you can see they are distinctly different. The Urnes style art is extremely sleek and appears as a very pure form of knotwork. It holds true to the very basic rules of knotwork (over and under, over and under) within an interweaving pattern and definitely shows that there was a lot of outside inspiration influencing the Urnes style. By this point, Christianity had managed to establish itself across much of Northern Europe and became extremely prevalent in the motifs found. As discussed earlier, the conversion of Northern Europe to Christianity involved many existing traditions becoming incorporated into Christian festivals or places of worship. Whilst the Christians incorporated some of the knotwork styles in their art, they were also very keen to destroy many of the runic artefacts and anything containing rival religious symbols, such as Thor’s hammer. The destruction of many of the Nordic symbols continued into more recent history as well. Even after WW2 there was further destruction as farmers and other people living in the country side would have destroyed any artefacts containing runes due to their later links with Nazi Germany. As well as containing influences from Christianity, the Urnes style also took influences from the Arab world. Although it is unlikely that many artists were able to read it, when Arabic scripture reached Scandivania, the artists must have found the alien writing to be very beautiful as they took inspiration from the shapes they found and used them in their artwork.It is also possible that Chinese / Japanese dragons may have also provided inspiration for the artists. From the very beginning of the Viking age, there were stories of Vikings who would have been on adventures to the Far East. Many of the adventures that failed had become legendary, however, there are other stories of ships who had passed beyond the edge of the known world and it is likely that these explorers would have brought some ideas back. Also, when you consider that the story of Leif Erikson discovering Vinland was not celebrated or documented to the extent that you would expect for such a huge accomplishment, it begs the question of what other great adventures could this seafaring people have been on? Is it possible that the Vikings knew more of China than we realise? Either way, it can be argued that Viking dragons do demonstrate certain similarities to the Chinese dragons in the way the beasts lappets flow from their noses, head and lips. This would be in fairly stark contrast to the traditional Western depictions of dragons from a similar period.